As previously discussed, I am doing a series of top 10 lists for my most beloved of shows - Supernatural - over the summer hiatus. Last time I ranked the Top 10 Manly Tears, so this time I've decided to lighten things up! While you wouldn't necessarily think a show about a couple of brothers hunting down demons, ghosts and other ghoulies would warrant much humor, the humor has, in fact, become one of the best parts of the show. Making this list of funny moments in Supernatural was incredibly difficult, because there are just that many moments to choose from. But below you will find my attempt! Please note that the titles for each number are also links to youtube clips of each of the moments mentioned, in case you'd like to give yourself a case of the giggles once again. There are admittedly a lot of funny moments in this homage episode to old classic horror movies, but there are a couple that really stand out thanks to "Dracula." 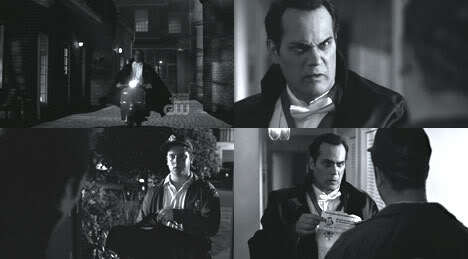 Firstly, after he's attacked Dean and the girl, he rides off on a moped! It's just hilarious to see a fully decked-out Dracula riding on a moped. 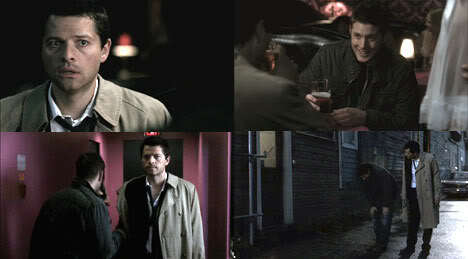 But the real clincher for me was right at the climax, he's about to kill Dean, then he gets a knock at the door. And it's... a pizza delivery guy! He double checks that there's no garlic on the pizza, and then goes to pay, with, naturally, a coupon! Dracula with a pizza coupon. It will never get old. You can't get more self-referentially funny than when Sam and Dean discover that there is a whole series of books based on the story of none other than Sam and Dean Winchester, complete with wacky super-fans. While I personally think they took things a little too far with the meta-references later in the series, the moments in this episode were hilarious. 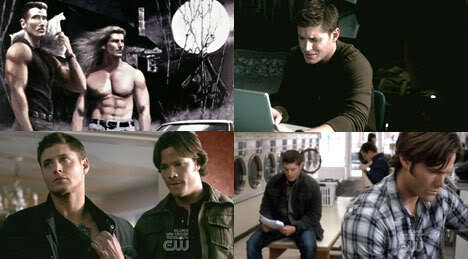 Sam and Dean learn what "slash" means, have to prove their knowledge of themselves, and get to read about themselves reading about themselves. Castiel has some of the funniest moments on the show in general, but I tried to limit his inclusion here to just one thing. Rather than "Hey, assbutt!" or "This isn't funny, Dean, the voice says I'm almost out of minutes! ", I decided to go with the rollicking ole time when Dean decided to take him to, essentially, a whore house, to lose his virginity. The look of abject terror on his face, and his various reactions to basically everything, make me laugh right along with Dean. Dean is rarely scared of anything, but when he contracted ghost sickness in this episode, he was suddenly afraid of everything. Whether that be driving over the speed limit, staying in a hotel room above the first floor, having a snake slither down his arm (well, who can blame him for that one? yigghhhhh), or even just the clock ticking on the wall. 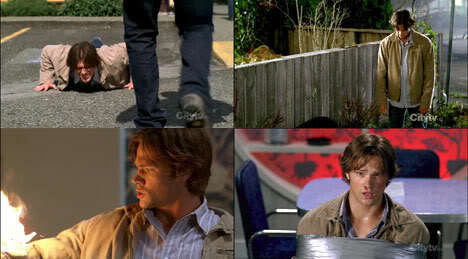 The funniest moment though, hands down, is when he and Sam are investigating an abandoned warehouse. They enter a room full of lockers and hear something rattle one of them. 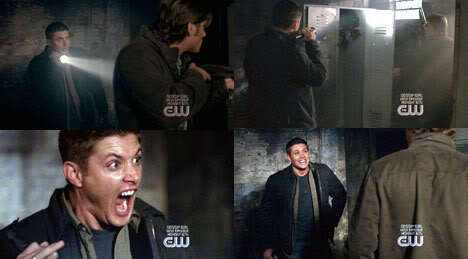 Sam opens the rattling locker and Dean lets out a full on banshee girly scream when a mere kitty cat jumps out! "That was scary!" he exclaims, followed by a hilarious little whimper. Ah man. Love it. 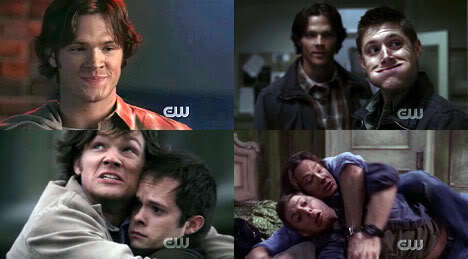 While Dean's many deaths in this episode are also pretty hilarious, they don't quite compare to this moment. Sam, having been through so many variations of this particular Tuesday, is fed up with trying to prove to Dean that he really is in a time loop and really does know everything that's going to happen. Sam proves it by saying everything Dean does until Dean finally relents that it must be true. And right before we find out what exactly Sam is supposed to measure with his ruler every morning! Ahem. 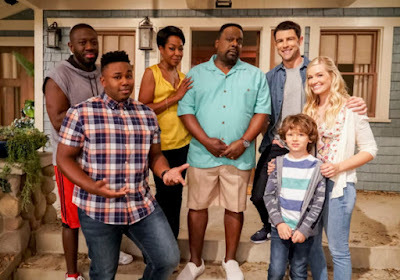 While about 3/4 of this whole episode was basically all about the funny, the part that had me laughing and laughing and laughing was when we got to see what the sitcom version's opening credits of the show would look like. And how do they look? SO HILARIOUS. The music, the lyrics, the various scenes happening in the background - they're riding little mopeds, they're riding a tandem bike, they're accidentally scaring each other and having a grand laugh about it, they're playing football... Best. Credits. Ever. This episode was the first time we met the Trickster, and he played some pretty funny tricks on people (slow-dancing aliens, anyone? ), but by far the funniest thing about this episode was the different viewpoints the brothers had on various situations. I couldn't decide between my top three moments, so I'm lumping them all together here. No, it's not cheating! Shh. Sam interrupting Dean's attempted hookup with a hot girl with some "blah blah blah blah," Dean eating about 20 caramels while interviewing a witness, or Sam hugging a guy and telling him he's "too precious for this world"... I can't choose! You can't make me! Maybe I'm cheating again, but it's kind of a whole sequence of moments, right? Right! Anyway, while Sam is in possession of a mystical rabbit's foot, his luck couldn't be greater. But once he loses it, his luck couldn't be worse. He trips and falls, loses his shoe, and manages to set himself on fire and reveal himself to the very people who are looking to capture and kill him. How he looked so dejected when he said, "I lost my shoe"? Come now, you know you were giggling like crazy. This was quite possibly one of the most out there and bizarre things I have ever seen on this show, which made it all the more hilarious. I seriously encourage everyone to watch the clip of this if you haven't already seen it. When the boys first meet Teddy, he wonders why he's here, and his owner Audrey replies "For tea parties!" His response: "Tea parties. Is that all there is?!" Dean and Sam convene outside to ponder whether they have to kill a teddy bear, and decide they would rather not have a "giant, flaming, pissed-off teddy on our hands." 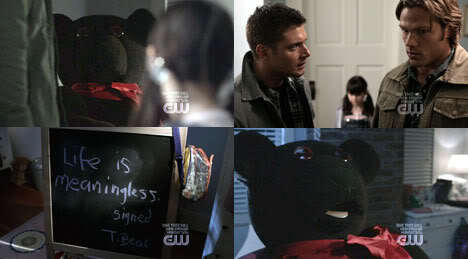 After they've left, we see a little scene where Teddy, so despondent with this life, has written a suicide note ("Life is meaningless. Signed - T. Bear) and proceeds to try to shoot himself in the head with a shotgun. But it doesn't kill him. "Whhyyyyyyyyyyy?!?!?!!" So crazy, so funny. And there you have it! Now, I know there are many funny moments that weren't included here, but do you think I got most of the best of them? Please know that I have a list of about twenty other moments that I just couldn't put into the top ten. Feel free to list your favorites that weren't included in the comments! The rabbits foot episode was some of my fave funny!!! 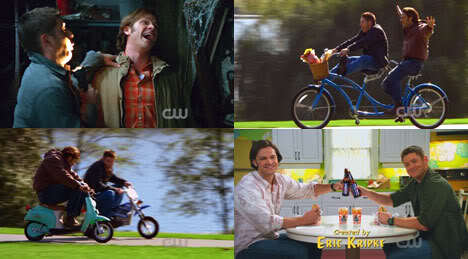 Nothing is more funny to me that Dean running of that little dog and Sammy talking about herpes.... I laugh for hours.. 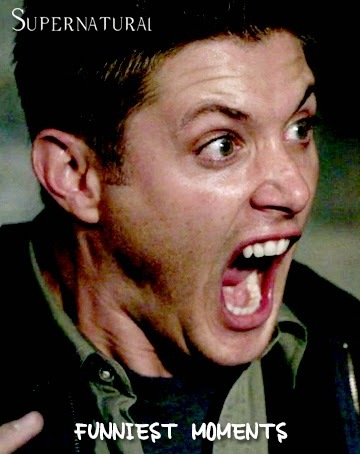 Seeing Dean scream like a girl in Ghost Sickness makes me laugh just as hard no matter how many times I see it. Priceless. The rabbits foot episode is a close second. What about Dean in the mental in mental hospital. PUDDING!!!!!!!!!!!! LMAO!!!!!!!!!! Agree with ALL of the above, but what about 3.13 Ghostfacers? 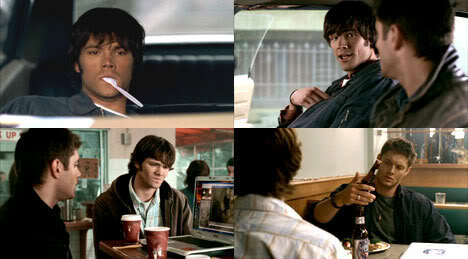 Dean: There's a box of salt in my duffel. Make a circle and get inside. Ed: Get inside your duffel? Dean: The salt, you idiots! Sam and Dean discovering the fandom would've been #1 for me and 'Changing Channels' would've almost tied with it for second place. @Sandi - I definitely had the "Pudding!" moment in my list of moments, but I just couldn't place it above the ones I have above. 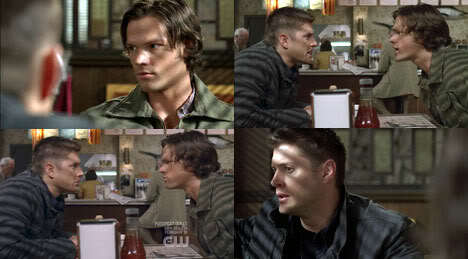 @Shareen - Ghostfacers is one of my fave episodes! I actually forgot about that moment in my huge list, but totally hilarious!! @Jen: Thanks for sharing and making the hiatus a little less painful for pining fangirls worldwide. No Ghostfacers?! That's easily one of the funniest episodes of the entire series! Ghostfacers is one of my favorite episodes, but it was too hard to pick a moment from it. If I had a list of the funniest episodes, it would definitely be high up there! I agree with all of these, but I would have included Plucky Pennywhistle, if only Sam's voice breaking over the phone when he's trying to tell Dean it isn't his "clown thing," the whole "ball-washer" and "shark week" bit, and the end tag with Dean's "PCP-crazed strippers" line make me howl every time.